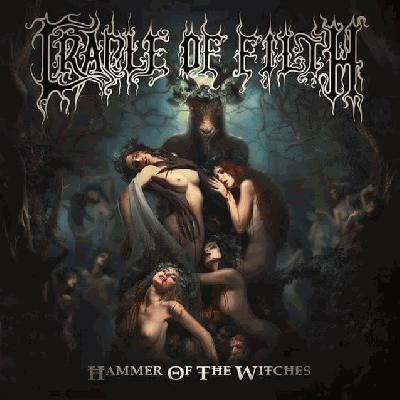 Simultaneously overblown and tasteful, Hammer of the Witches is ACTUALLY Cradle of Filth's best album since Midian. No longer using their symphonics as a crutch for weak songwriting, the skill of new axe-slingers Richard Shaw and Marek 'Ashok' ?merda make this one of Cradle's most guitar dominated albums to date. Of course the band still has an affinity for grand orchestrations, but their incorporation is more thoughtfully done, accentuating the other instruments instead of suffocating them. As if these other factors weren't enough, Dani sounds at the top of his game here, his vocals seemingly revitalized by band's new blood. Even Cradle haters may have a tough time scoffing at this one. It's incredible how much creative energy the new axemen has put into this release. Perhaps Allender was the one too blame for the poor albums after Midian. This is their best in years. I've generally avoided the Filth and only treated them as a running joke in The IT Crowd ("It sounds horrible, but it's actually quite beautiful") but I'm genuinely impressed by this album. Everything works together, the guitars are lethal and the symphonic elements accentuate the live instruments nicely. Dani Filth has a very "love it or hate it" vocal style but it wouldn't be Cradle of Filth without his trademark banshee wailing. I couldn't help the feeling of shivers down my spine when I first heard this record. Cradle of Filth has always been one of my favorite bands, but somehow I was really losing my hope in them after that strike of weak releases beginning with Damnation up through The Manticore, but then I decided to catch up and give them an opportunity with this one, and it blew me away from start to finish. This is one of the most rewarding listens I have had in a long time. A serious contender for album of the year and a very welcome comeback from one of the most divisive bands out there. This is their most fun and seamless release in quite a while. The line-up changes yield their most focused songwriting in years, especially given the centerpiece of twin guitar riffs, harmonies, and soloing throughout. It's about time these guys did something right. The Manticore and Other Horrors was a truly abysmal album and this is a much welcome return to form. Let's hope they keep the current line up this time around. So potent was the star under which extreme metal troupe Cradle of Filth were born. Their latest album Hammer of the Witches will remind many of the band's earlier, less mainstream style, albeit with a noticeable modern touch this time around. Even if you find it hard to like Dani Filth, you'll eventually admit that his vocals are legitimately powerful. The departure of longtime member Paul Allender and the return of a six-person lineup makes CoF's newest library of souls sound fresh, aggressive, and plain fun above anything else. "Blackest Magick in Practice" will go down in history as one of my favorite songs that these guys have concocted. A surprising return to form for this marmite of a band. The love hate as usual boils down to Danis unique vocs style. In the Hammer... however he does not over use his high pitched screams which finally blends wonderfully with the 2 new axe slingers. The great persistent high tempo keeps the songs flowing, with rare symphonic fillers. Some masterful organ based backgrounds really do make some of the songs feel majestic and well crafted. High time for Cradle fans. Oh, I'm sure I'll find a way to hate it.